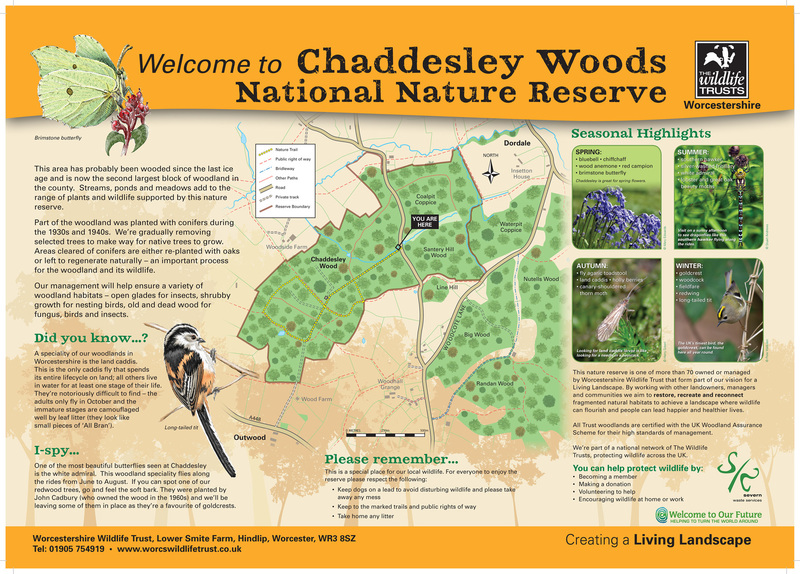 Chaddesley Woods were probably mentioned in the Domesday Book as the ‘wood of two leagues’ and we think that parts of the site were wooded since the Ice Age 6-10,000 years ago. 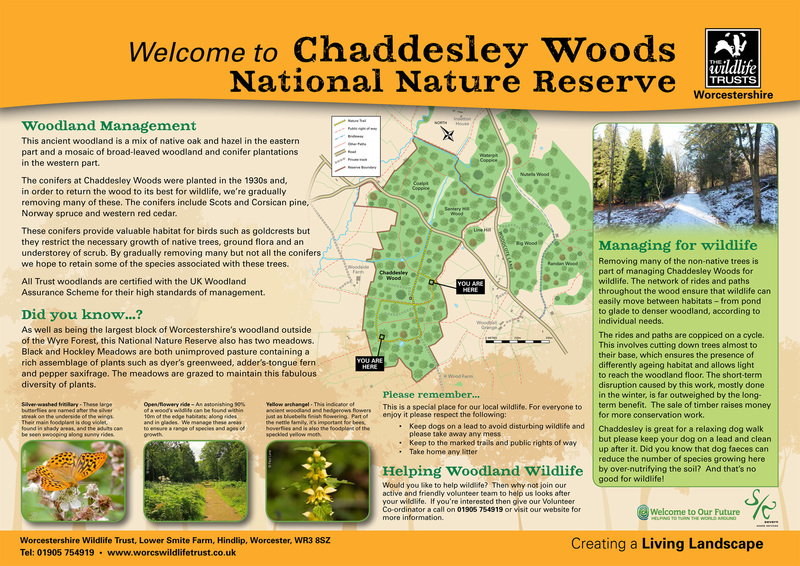 The presence of ancient woodland indicator species support this – flowers such as yellow archangel, herb Paris and dog’s mercury and trees like small-leaved lime and wild service trees. Visitors to the eastern half of the nature reserve will find themselves in ancient woodland that is predominantly mature oak with hazel coppice. The understorey also contains holly, rowan and other berry-bearing shrubs which are popular with winter thrushes such as fieldfares. Midland hawthorn also thrives here – a rare shrub which is identified by the two seeds in its berries as opposed to the normal one. We manage this part of the wood to provide a range of habitats. Open glades are important for invertebrates and encourage shrubby growth which provides nesting cover for birds. Some old and dead oaks are retained for hole-nesting birds, fungi and invertebrates. At the right time of year the wood is full of birdsong and lucky visitors may catch a glimpse of the elusive woodcock. There are also two areas of meadow in this part of the reserve, although these are only accessible on special open days. Both Hockley Meadow and Black Meadow are old pastures with notable wildflowers such as knapweed, dyer’s greenweed, pepper saxifrage and adder’s-tongue fern. The meadows are grazed to maintain their floral interest. By contrast, the western half of the reserve is a largely planted woodland of broad-leaved species and extensive areas of conifer. The conifers – Scots and Corsican pine, European and Japanese larch, Norway spruce, grand fir and western red cedar –wouldn’t normally grow here and we’re gradually clearing these trees and replacing them with native hardwoods that are more suitable to the local geology and attract summer migrants like chiffchaff and blackcap. Crossbills sometimes breed in the conifer plantations – their unusual beak structure of crossed tips allows them to feed on the seeds. A Worcestershire speciality, land caddis, occurs at Chaddesley Woods. A national rarity, this is the only one of almost two hundred species of caddis fly that spends its entire life-cycle on land. It burrows in leaf litter and adults only live for a couple of weeks in autumn. Wheelchairs can access main track via the main entrance on Woodcote Green Lane. Mainly on western half of reserve; extensive network of paths & rides. The main track is stoned otherwise all other routes are on earth paths and are unsuitable for wheelchairs/buggies. Roadside parking in lay-bys by main entrance but limited.